I am much more confident about calling myself a writer than calling myself an artist. However, I do both. I have even had commissions for my artwork. The one commissioned work that I am most proud of is the one I did of a farm house many years ago. The family farm had long ago been sold and no longer existed, but the woman who had lived there as a child asked me to paint her a water colour of it based on an old oil painting and several photos. The oil painting had been done by an Austrian prisoner of war who had been working on a farm across the road. The oil painting had deteriorated as it had been stored in a garage for many years. I agreed to take on the challenge. I pored over the old painting, went to see a farmhouse made of similar materials and spent a great deal of time on the painting. I decided, as a surprise, to add in a vignette of the woman and her two siblings as children on the bench swing they had in their yard. The painting was fairly large, about 13″x16″ and the family was pleased. I got the most money I’d ever received up to that point, about $250. One other similar commission I did for my uncle who had a ranch in Alberta. He sent me the plane ticket to visit them and I did for a whole week. I had a wonderful time, made several sketches (in spite of the efforts of Tiny, their St.Bernard, to sit on my lap) and came home ready to paint. I painted five versions of the ranch home – two in the winter scenery and three in the summer scenery. I sent all five to my uncle so he could choose his favourite. He decided to have all five framed, kept one for himself and gave the others to his children who all had their own homes. I was very pleased with his satisfaction because he collected watercolours. I considered it a good compliment. 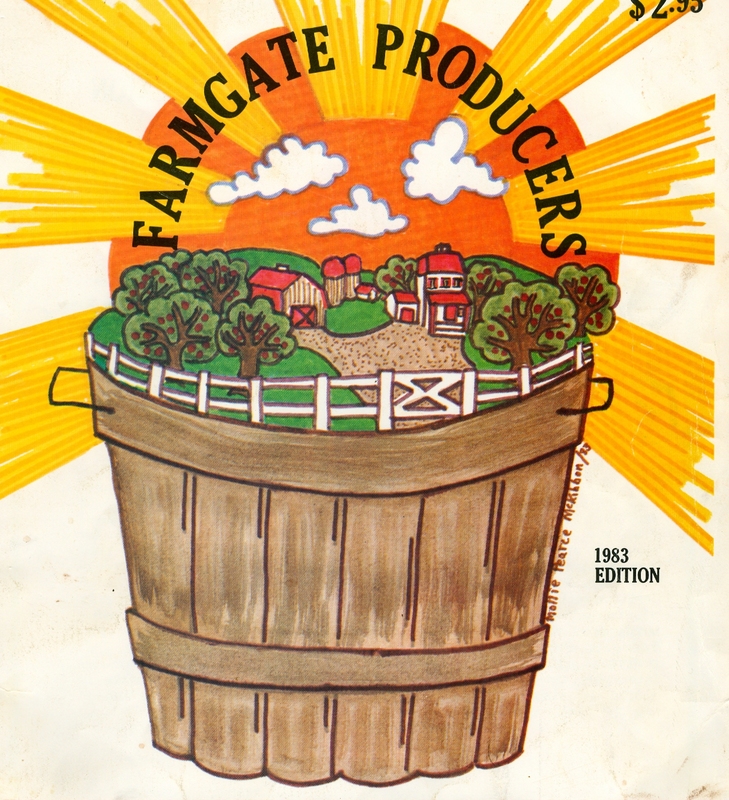 Another commission was for the cover of a local magazine advertising farm gate produce. I tried a number of designs for the publisher. He chose two, one for the front cover and one for the back. The design he chose showed a farm in a bushel basket. The other design was the same one , as an outline. I later found out he had that design enlarged and framed for his wall. I have done illustrations for several magazines and two book covers. One of my illustrations caused a bit of a controversy because I showed a baby bottle and one of the magazine readers objected to it. She felt that because that magazine was for Moms and that they promoted breast feeding the bottle was sending the wrong message. I countered with the fact that many moms fed their children juice and water from the bottle. So for a couple of issues we had letters flying back and forth. I love telling a story with words and through drawings. I have a great admiration for a local evangelical who is also an artist. He has done several murals and he travels with his wife every summer to camps and isolated communities where she sings songs on her guitar for the children and he draws to illustrate the Bible stories she tells. I think this is a great teaching gift. From childhood to the present I have been driven to draw and write. I intend to go on doing so until I am no longer physically able. I can’t imagine any other way to live.